The Infinity Travel Pillow is one of the hottest travel products on the market today. Marketed as an innovative sleep solution for seasoned travelers, its unusual shape and design set it apart from other travel pillows on the market. 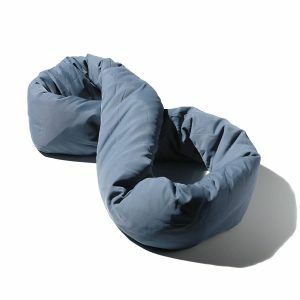 As a veteran traveler, I was curious: does the Infinity travel pillow live up to the hype, and could I really sleep better in transit while using one? Any traveler knows that a quality pillow can make or break the sleep experience. A good pillow can make it easier to fall asleep, stay asleep, and sleep more deeply in otherwise uncomfortable circumstances. The Infinity Pillow is so named for two reasons. Firstly, it comes in a circular ‘infinity ring’ shape. Secondly, and perhaps most importantly, it can be used in an infinite variety of configurations to suit the preferences of the user. The pillow is unique due to its innovative shape and is very much unlike any other pillow on the market today. It is flexible by design and can be shaped in almost any way to suit your body, sleeping preferences, and your seating arrangement during travel. It can be used on buses, trains, airplanes, on long car rides, and just about any other form of transportation. I found the Infinity pillow was initially not very intuitive to use, and I was a little confused about how to make it comfortable. It does not come with any instructive diagrams or a manual. However, this is perhaps part of the beauty of the product: it is left to the user to figure out how to use it and what feels best. Once I got the hang of actually using it, I found it to be very comfortable and easy to use. I tested the Infinity pillow on an airplane flight. After trying a few different arrangements, I found it was most comfortable wrapped around my neck and shielding my head from the airplane window. This was quite relaxing, and kept my neck and shoulders comfortable and protected my scalp from the hard windowpane. The pillow can be configured in an infinite variety of ways, as the name suggests. 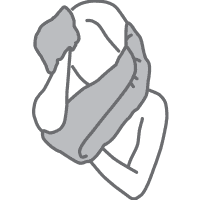 As I played around with it, I found there were endless ways to twist, scrunch, wrap, and bundle it to make my back, neck, head, shoulders, and arms more comfortable to sleep. As I did while I was testing the pillow, one use of the Infinity pillow is to use it to sleep against a window, as you would in an airplane or automobile. Another primary use of the Infinity pillow is for napping on a flat surface, as you would on a desk at work. This can be done anytime you are seated in front of a flat surface. Perhaps the most common way to use this pillow is a neck support. 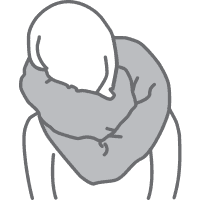 This is done by wrapping it around your neck to support your head while you are sleeping upright. However, it can also wrap around the arms for arm support depending, once again, on personal preference. Another way to use the Infinity pillow that I had not considered was a lumbar support. Using the pillow behind or around the lower back provides support for the muscles of this area and the bones of the spine. By far the greatest advantage of the Infinity pillow that I experienced was how comfortable it was to use. Once configured properly it took very little time to fall asleep once I was using it. It is also breathable, meaning that even in the warmest of environments it is comfortable to use and will not cause the accumulation of moisture. Another significant advantage of the Infinity pillow is its flexibility. Unlike traditional travel pillows commonly sold in airports, this pillow can be configured and reconfigured for different sleeping positions. As far as I am aware, it is the most flexible and versatile travel pillow available on the market today. The Infinity pillow is machine washable, making it even more traveler-friendly. Although I did not spill anything on my pillow while I was testing it, it is easy to see how it could come into contact with all manner of substances while en route to your destination. Unlike most conventional travel pillows, this pillow can easily be thrown into the washer with laundry. All advantages mean the infinity travel pillow is the best travel pillow on the market for seasoned travelers. No matter what type of traveler you are, the Infinity pillow will surely help you sleep better on your journey. Plus, shipping in the U.S. is free! As positive as my overall opinion is of this product, it has some downsides. Perhaps the largest drawback is its complexity. The pillow does not come with any instructions and may be initially confusing for some users. Even for myself as a seasoned traveler, the pillow was daunting at first as I tried to figure out its features and how to use it. For those unfamiliar with this type of pillow, there may be a steep learning curve as they begin to try it out. Another significant downside to this pillow is its size. It is relatively bulky, and larger in size than many of its counterparts. Travelers tend to be a very size-conscious bunch and want to travel with the least possible amount of luggage, and I can see how the larger size of this pillow is a substantial drawback for those travelers. The final drawback of the pillow is its cost. The pillow is more expensive than traditional, cheaper travel-type pillows that one might see in stores in the airport. Some travelers might not want to pay the extra cost of having a more versatile sleep option. 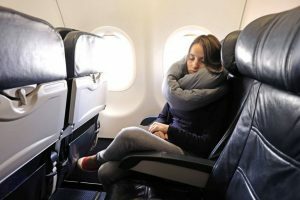 Whether you are traveling for business, leisure, or other reasons altogether, the Infinity pillow is probably more comfortable than your other options when it comes to sleeping on the plane. For myself, I found it comfortable and beneficial in my travels in terms of the overall quality of my sleep. Though I did like the pillow, I found it overall was slightly too complicated for my simple need: a place to rest my head. For a frequent traveler who invariably finds themselves in a diverse range of seating and sleeping arrangements, this pillow comes highly recommended. It is certain that after experimentation with the different ways to wrap the pillow around you, you will find a method of using the pillow that is comfortable and beneficial for you. Why Does Snoring Get Worse with Age?